Donna Morton of SNIP AND STITCH SEWING CENTER, NANAIMO, BC has designed this charming project for Valentine’s Day. 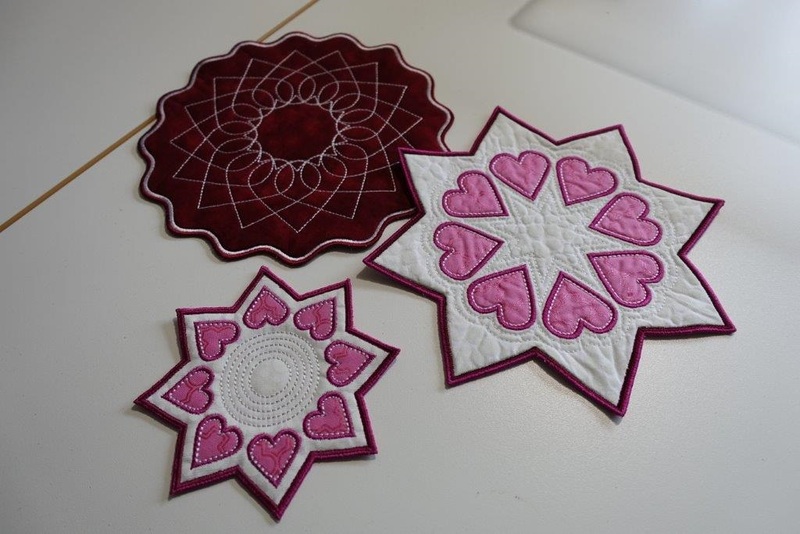 She used the Artistic Sewing Suite software with the cutting needles option to create a project where the cutwork needles do all the tedious cutting of the heart applique shapes for you. She also used the Janome Digitizer MBX Cutwork module which does a very similar thing. The cutwork needles also do the cutting around the pointy & curvy edging on the little mats. AND our Janome embroidery machines do the applique and embroidery so there is NO fussy manual cutting & applique stitching needed. What more could we possibly want?! Thanks, Donna, we love your project. This entry was posted in Creativity, Digitizing, Horizon MC 12000, Janome Embroidery, JANOME EMBROIDERY SOFTWARE, Janome Fun, JANOME HORIZON MC15000, JANOME MC 9900, JANOME MC350E, JANOME PROJECT IDEA, MC 11000, Memory Craft 15000 and tagged ARTISTIC SEWING SUITE CUTTING NEEDLES, ARTISTIC SEWING SUITE SOFTWARE, CUTWORK NEEDLES AND ARTISTIC SEWING SUITE SOFTWARE, DONNA MORTON IN THE HOOP HEART MATS, JANOME CUTWORK NEEDLES, Janome Embroidery machines, SNIP AND STITCH NANAIMO BC, TERIAL MAGIC SPRAY, VALENTINE'S EMBROIDERY PROJECT FROM JANOME. Bookmark the permalink. Very much enjoyed my time with you at Snip and Stitch. The staff and their customers are so friendly. Thanks for all the info and information and your samples are great. Hope to see you in Kelowna. We do love Donna Morton’s designs. She brings such a richness to Snip and Stitches classes. I have learned so much from Donna. She really helped me get the most out of my Janome’s. I started years ago with a MC6000 and MC 11000 from Sawyers, then a MC 12000 and MC 15000 from Snip and Stitch. Hi, I have Digitizer Jr so can’t use the software mentioned. However, I also have EQ7 with the EQ Stitch plug in, and it looks like that will work. Great project, thanks.